Sponsored by CarPET Scratch Stopper and hosted by Mom Does Reviews and her Feline loving blogger buddies! Stops cats from scratching carpets at doorways. INSTANTLY! The CarPET Scratch Stopper is made of durable plastic material and is equipped with grippers at the bottom surface that helps prevent it from moving, and the top is a non-slippery surface. The CarPET Scratch Stopper is easy to use. Simply place it in your doorway with the device facing the carpet you want to protect and close the door. Your cat will be unable to grip onto the surface and slide off when scratching is attempted,immediately stopping the destructive behavior. 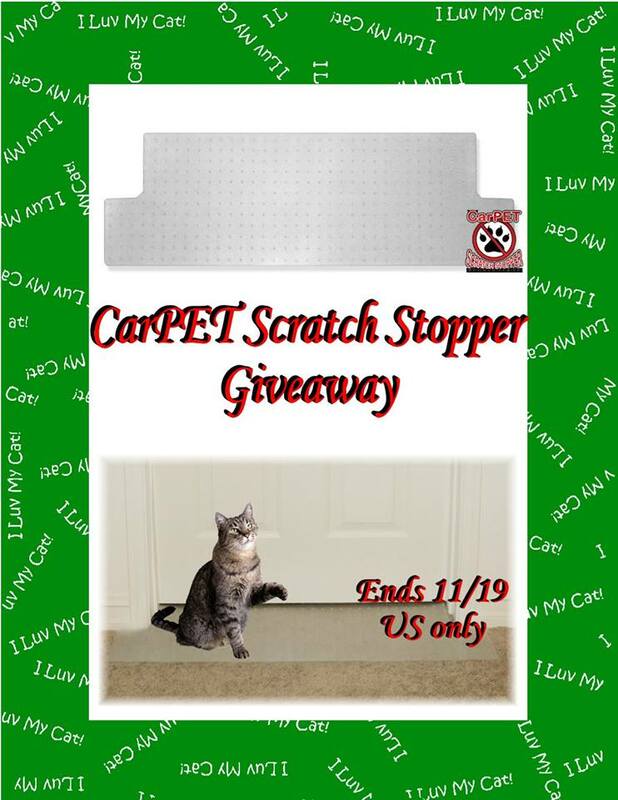 One Lucky winner will get a CarPet Scratch Stopper for their doorway! The participating bloggers were not compensated for this post. We are not associated with any of the companies named above. No purchase is necessary to enter. Void where prohibited by law. The odds of winning are based on the number of entries received Open to the US , 18+ only. Confirmed Winner(s) (by Random.org) will be contacted by email. Winner(s) have 24 hours to respond before a new winner is chosen. No purchase necessary. Void where prohibited by law. The sponsor(s) will be responsible for product shipment to winner(s) of this giveaway. My blog is not responsible for product shipment/delivery. This event is in no way administered, sponsored, or endorsed by, or associated with, Facebook and/or Twitter, Google, Pinterest. This disclosure is done in accordance with the Federal Trade Commission 10 CFR, Part 255 Guides Concerning the Use of Endorsements. Entrants must only enter with either one email address, IP address and/or Facebook account, anyone found violating these rules will be disqualified. It is at the sole discretion of the admin of the giveaway if the winner has met the rules or not. My cats name is vanilla. I have 4 cats: HC, Toombs, Kitty Cent and then there’s our little one that doesn’t have a name yet. We have to cats named buttercup and mouthy. my 2 boys are named Stubby and Shadow! Gemini is the name of my remaining cat (who is 13 years old.) My 19 year old cat, Lucky died recently. I have one very sweet cat, Te Te. Her name is CharlieAnn, and she’s beautiful. I have 3 cats and their names are: Stripe, Lena. and Charlotte. My cat’s name is Tink. Short for Tinklebell. We have 1 cat and her name is Precious. She scratches on EVERYTHING!!!! It gets annoying actually. Thank you for the chance to win something that she may actually scratch instead of my rugs and furniture. We’ve tried sooooooooooo many different things and none have worked thus far. we have two cats, Baby and Merlin.